PRESS RELEASE: Join Xyntek at Emerson Exchange 2018! The Emerson Global Users Exchange is more than an industry-leading technical conference…it is a community of process automation leaders. Several hundred workshops and short courses are specially selected each year for practical results on pertinent issues such as reducing production costs and improving agility with Automation. Get the knowledge you need to innovate! 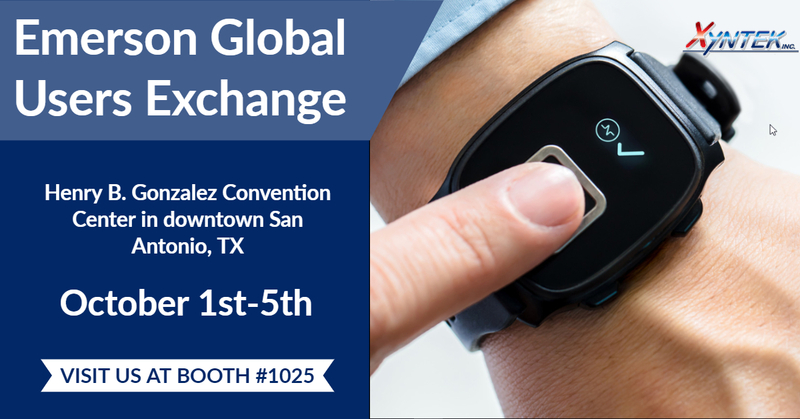 Xyntek's booth setup will encourage users to interact with our state-of-the-art Biometric Solutions, Xyntek will be demonstrating our flexible Atos-ID Center software platform, along with Nymi Always On AuthenticationTM wearable biometrics band. Additionally, we will be showcasing the new smaller form factor Iris ID R100 iris scanner. Xyntek’s Biometrics Solutions enable manufacturers with seamless user authentication across business critical systems and applications, including Manufacturing Execution Systems, Electronic Batch Systems, ERP, instrumentation/equipment, and many other systems. With Industry 4.0 upon us, Xyntek’s solutions will prepare you for the transition! Don't miss out and register for the event today!